Does anyone even remember the Mitsubishi Outlander exists? Even immediately after sitting in one, it's easy to forget. It's one calling card in other markets is the availability of a super-efficient plug-in hybrid version. And it's coming to the U.S. Just not until 2015 now. Automotive News reports Mitsubishi is having a hard time getting sufficient quantities of lithium-ion batteries from supplier LEJ to go in both the Outlander plug-in and the i-MiEV that almost no one buys. 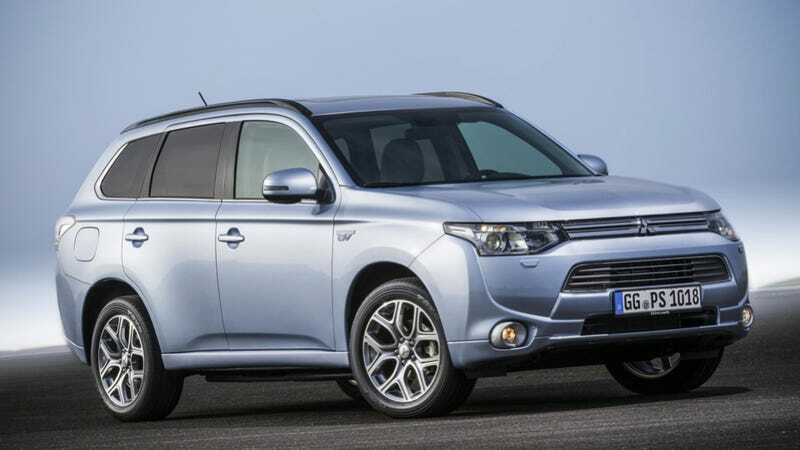 The lack of batteries has delayed the introduction of a U.S.-bound Outlander plug-in two years, now pegged for 2015. And the Outlander can use all of the buzz it can get. Sales in November, while up 139% over November 2011, numbered just 1,399 cars. Perhaps the bigger issue for Mitsubishi, which Automotive News points out, is that so much of their future product plan and key to their return to relevancy is based on plug-in technology. That includes a new Outlander Sport and Montero, both destined for the U.S. Still, with all of the questions surrounding the financial sense that plug-ins and full electrics make, should Mitsubishi really hurry up and get more batteries? Or should they just get busy building trucks in the U.S.? Will American-Made Trucks Be Mitsubishi&apos;s Return To Relevancy?